Steel magnate Andrew Carnegie, one of the richest men the world has ever known, had just one child, a daughter named Margaret who was born in 1897 and lived with her parents in New York. 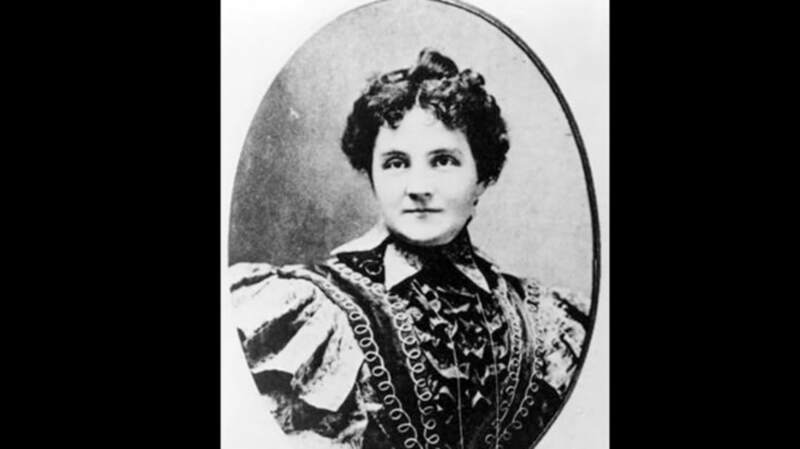 But for a period of time in the early 1900s, a woman calling herself Cassie Chadwick had some of the most important people in Cleveland convinced that she was Carnegie’s secret daughter, born from a long-ago affair. The lie was convincing enough that some of her “father’s” closest friends loaned her money—to the tune of an estimated $16.5 million. Betty Bigley started defrauding people in 1870 at the ripe old age of 13. She told people that her uncle had died and left her a large sum of money, and even wrote a letter that looked so convincing a bank agreed to give her an advance. Not bad for a girl barely in her teens. The deception didn’t last long—Bigley was found out when the money never came through. She apologized and swore never to do it again. She did, of course. At 22, Bigley purchased expensive stationery and forged another letter from an attorney, saying that a wealthy philanthropist had died and left her $15,000. She even had business cards printed up that said “Miss Bigley, heiress to $15,000,” and handed them out to cement her status. It sounds ridiculous today, but at the time, people were utterly convinced. She had no problem procuring loans from banks and private individuals. Next, Bigley moved on to Cleveland. She married a doctor and immediately racked up so much debt that Dr. Springsteen divorced her in just 12 days. After another husband and stints as fortune tellers named Mme. Rose and Mme. Lydia, Bigley married another doctor named Leroy Chadwick and began hatching her Carnegie plan. She arranged to run into an acquaintance of her husband’s during a trip to New York, and asked him if he would mind escorting her to her father’s house for a quick visit. The acquaintance was astonished when the carriage pulled up to the Carnegie mansion. Chadwick disappeared inside and emerged 30 minutes later, carrying a brown envelope. She confided that Carnegie was paying her large sums of money to keep quiet about her parentage, and asked her husband’s friend to please keep her story quiet. In reality, Chadwick had gone into the house pretending to be checking the references of a maid who said she once worked for the Carnegies. The brown envelope she pulled out afterward contained promissory notes she had forged well in advance. It didn’t take long for Dr. Chadwick’s friend to blab, which was exactly what "Cassie" had been counting on. Her supposed lineage was soon well-known all over town, and she was able to easily get loans for hundreds of thousands of dollars. An acquaintance of Carnegie’s from Pittsburgh handed over $800,000 without batting an eyelash. Chadwick’s spree finally came to an end in 1904, when one businessman had the gall to ask for repayment on the $200,000 he had loaned her. Her lies and schemes quickly fell apart, and in 1905, she was handed a 10-year prison sentence for attempting to defraud a national bank. Chadwick died in prison in 1907.